As a player of Warhammer (The Game of Fantasy Battles), for some twenty odd years, I was as surprised as any by the route that Games Workshop decided to take when their iconic game was essentially brought to a close, being replaced by a new game – Age of Sigmar. I believe that the majority of players are in agreement that although Age of Sigmar may be considered a progression of the Warhammer brand, it can’t be considered the 9th Edition of the game we knew. It is Age of Sigmar version 1.0. As a lot has already been said on the subject of this change of direction, and what people’s very impressions of the new game are (including what I have said in an earlier article), I am not going to go over old ground. Instead, I would like to look at the side effects of such a monumental change in our gaming world. You see, right back during the era known now as ‘The End Times’, which began with the return of Nagash to the Warhammer World, and culminated in it’s destruction, there was a great amount of uncertainty within the Great Warhammer Playing community, about what the future of the game might be, and what it would look like, and even whether our prized collections of models themselves had a future in tabletop wargaming. Some people took the decision during the period between the climax of The End Times and the arrival of Age of Sigmar to venture into other games and leave the Warhammer brand behind them. Others were already playing other systems and simply shifted their focus away from Warhammer. Dave Witek (Garagehammer) was proved right as more people decided that games like ‘Kings of War’ were actually worth more than a cursory glance. I believe it is true that Age of Sigmar takes less time and effort then Warhammer 8th Edition did. 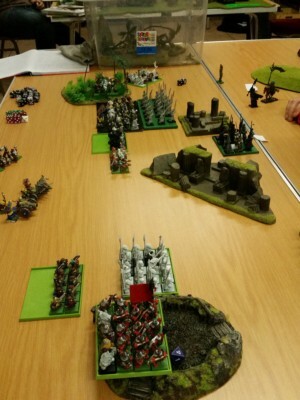 Games are quicker, armies are generally a little smaller. It is also a little less widely played as gamers have shifted their gaming focus, and so the number of games to be had has also reduced somewhat. One of the most eager Warhammer players at our club has decided that Age of Sigmar really isn’t the kind of game that grabs his attention, and the other guys that played 8th spread their time between that and 40K. The result of this is that a lot of players have taken up new games they had never tried before, perhaps wanted to but never had the time because they spent so much time on Warhammer Fantasy, or had bought but never made much of. Now that what was the main game for a great many people is either less demanding or less enticing, other games are grabbing a greater proportion of our attention that they ever could before. For myself, this means that I have started to play games I had never seriously considered before, such as Kings of War which a number of the guys at our club wanted to try as an alternative to Warhammer 8th Edition. And once my mind was open to one ‘non-GW’ game, why not a whole raft of them? Don’t get me wrong, I haven’t lost my mind and started playing games like Warmachine or Malifaux, but I have picked up the rulebook for Frostgrave, for which I am assembling warbands as we speak, and am looking forward to immensely. This is a game that is both simple to play, but enormously broad in the modelling opportunities it offers as a result. This is a game one of my club mates had picked up and was keen to promote within our group. After learning a little about the game, that the rulebook was just £15 ish, and that I only needed a dozen or so models for a warband, what’s not to like? 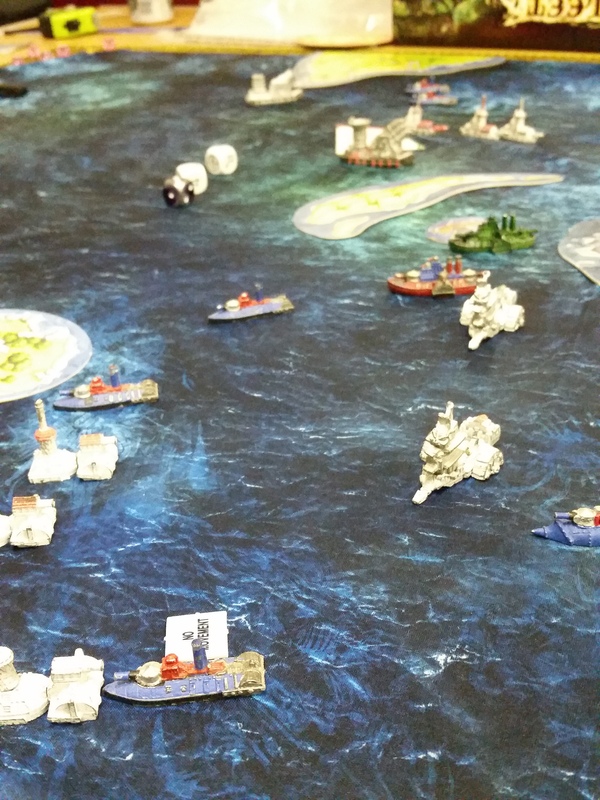 I am even looking at backing a Kickstarter, which is something I would never have considered when I was limiting my attention to Games Workshop games – Hawk Wargames ‘Dropfleet Commander if anyone is interested, which ends on Thursday December 3rd at 23:00. I do love a Naval game, and with enormous spaceships, yes please! Though I have heard a great deal about games like Star Wars Armada, X-Wing and Star Trek Attack Wing, I am not a big enough fan of those genres to want to play war games based on them, and if I was to choose one, it would be Attack Wing – call me heathen, but Star Wars was a bit too much of a ‘trendy’ brand to be into for my liking. And the best thing about all this gaming expansion? The very best thing? Well, I have been playing and collecting for a fair old while, and in that time have picked up several excellent Games Workshop games which for the longest have sat in boxes in the garage. Some might say they were gathering dust and taking up space – mainly the wife saying this – but I always believed that they were just waiting for their chance at glory once more. That time is now! In the last few weeks I have played two games of Man O’ War, I have Warhammer Quest ready to go, plus Necromunda. We have been playing Blood Bowl at our club for a while, with our 3rd season ready to kick off – puntastic – and I am pretty keen to get the guys playing some Battlefleet Gothic as soon as I can, especially as I doubled the size of my Chaos fleet only a few months ago. When I have all of these games and enough models for multiple armies/fleets/gangs, so the guys at the club can have a go without having to invest anything first, why spend a load of money on new games when the old ones are some of the best! 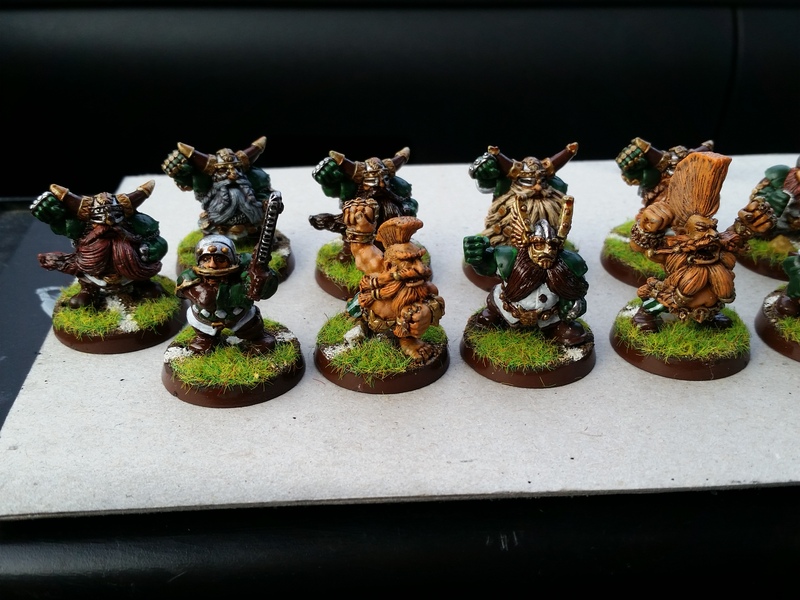 Age of Sigmar from a few weeks ago – boy those Ogres hit hard! Where do we go from here? Well, at the moment I have gone from being active in just three games (Warhammer 8th, 40K and Blood Bowl) to being active/ready to be active in seven or more. My goal for 2015 was to paint at least 250 miniatures to a battlefield standard – my Year of the Brush – and I think that 2016 will be my ‘Year of Battle’, in which I want to be playing as many different games as possible, as often as possible. It certainly helps that a number of my favourite podcasts have expanded their coverage to more than just the one system, because every show gives me a nudge to get that alternative game out and get rolling some dice – special mentions to Chumphammer for a plethora of different miniature wargames, Canhammer for 40K and Age of Sigmar, Garagehammer talking about Age of Sigmar, Infinity and Kings of War, and newcomers dedicated to Age of Sigmar, Mortal Realms. I think my next few articles will be about either my first few games of some of the new systems I am trying (Kings of War and Frostgrave), and how I get on coaxing new life out of some older games (Man O’ War, Battlefleet Gothic, Necromunda and Warhammer Quest) – so one last word about what I hope will be fantastic news from Games Workshop this week; the Specialist Games team are returning, hopefully with rules and miniature support for all those older games – what a fantastic Christmas gift! As always, thanks for reading – Eternal Wargamer. I commend you on your attitude. It’s easy to be angry and jaded but to instead see this as an opportunity to branch out and diversify – in a positive way, is rare. I’m also super excited about the specialist game announcement. I’m being positive and hoping to see new models, new rules and actual support. GW’s specialist games hold a special place in the hearts of many and when they disappeared it was a sad day. Here’s hoping for a well deserved revival. I think that any support for the Specialist Games range has to be a good thing, but if Games Workshop want to build on theit recent and positive approach to contact with the gaming community, I hope that they put some feelers out at least regarding Blood Bowl before they try and update or change anything. Agreed. The community has carried Blood Bowl for so long that if GW doesn’t look at what the community has done then they will really be shooting themselves in the foot. It’s the same with Epic, it has a great community (smallish though) and the changes they’ve released has been mostly very good. Again, I think Games Workshop would do well to communicate with the player base. There is an opportunity there to take advantage of the play testing that has been done by the community. Diversify, man! There is an amazing choice of games and I commend you on such an open minded attitude. Like you, Frostgrave has grabbed me right by the inspiration and I’m excited to get some games in soon. 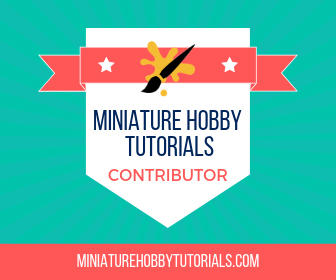 It’s a great chance to re-purpose some of the mass of Warhammer figures I have lying around. 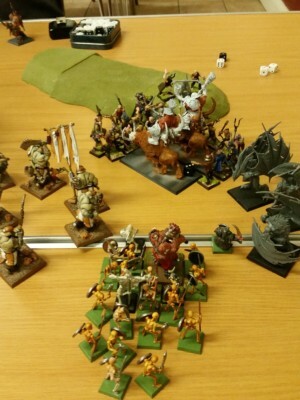 Not only is it a renaissance of gaming, but it’s the dawning of the age of the skirmish game. There’s everything from sci-fi with games like Infinity, steam punk with Warmahordes, strange in Malifaux, there’s even Kung Fu (http://www.spruegrey.com/category/a-fistful-of-kung-fu/) and any number of others. Guildball has popped up on my radar as well. However, the rebirth of Blood Bowl may dampen that interest, although rumour has it the return of Blood Bowl won’t be until 2017. So I’m looking forward to using that as an excuse to pick up another system. It’s a Golden Age to be a gamer, my friends. A Golden Age.